The clinic is currently accepting patients who require orthodontic and paediatric treatment. The Faculty of Dentistry operates state-of-the-art general and specialty clinics to support our educational programs. We've been providing public dental care for over 100 years. More than 100 dentists and dental hygienists support 167 dentistry students and 64 dental hygiene students in our clinics. The students provide care for approximately 10,000 patients each year. We welcome patients who are willing to work with our students as part of their education. Our hours of operation are 9:00 AM to 12.00 PM and 1:00-4:00 PM, Monday to Friday. Contact Patient Services at 902.494.2101 to book your appointment for an initial screening. This appointment will determine whether you are accepted and agree to become a patient. 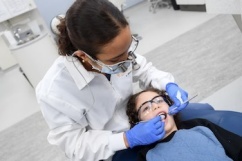 Our students provide dental care at a reduced rate compared to general dentists in the area. Please bear in mind that patient appointments are generally two to three hours. Dalhousie University is a smoke-free and scent-free environment. Please do not wear colognes, perfumes, etc. to your appointments. Please bring a list of any medications you are taking to your first appointment. All children must be accompanied by an adult. For safety reasons, children who are not patients cannot accompany adults into the treatment area. Please call Patient Services if you would like to make an appointment for your child(ren) at the Paediatric Clinic, which takes place on Tuesday mornings, 9:00 AM-12:00 PM. Our clinics are educational facilities. The services are provided by students, and all treatment is supervised and approved by qualified dentists, specialists and dental hygienists. Patients who are accepted for treatment provide practical clinical experiences for students and receive quality care at reduced fees.